Australia is full of wonderful interesting animals, trees, plants and birds. I wrote about one of my favourite trees, the boab, in an earlier post, and now it’s time to share something about one of my favourite birds. Laughing Kookaburras make me smile, cheeky Parrots are hard to be beat… but for pure awesomeness the prize goes to the Cassowary. I’m going to ignore all the talk of them being the most dangerous birds on earth (because what are the chances… really?) and concentrate on how amazing they are. Information about the Cassowary’s size, sounds and habitat is below. But for me, it’s the way they look that makes them a stand-out in the world of birds. 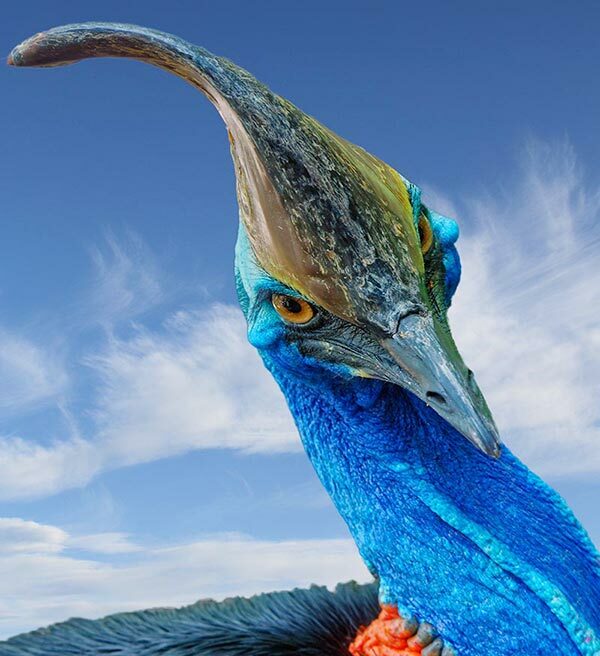 The Cassowary has a prehistoric appearance, with piercing eyes, armour-plated helmet, super-strong beak and stunning blue neck. Is there any bird out there that has this combination and is also is so large that, at a stretch, it can look you in the eye? The Cassowary is a large flightless bird, the third largest of a family of birds called ratites which includes the ostrich and the emu. In Australia, the native Southern Cassowary is classified as endangered due to habitat loss, and it’s estimated there may be as few as 1500 left in the wild. Their habitat is tropical rainforests, they forage for fruits and seeds and occasionally eat small dead mammals, snails and birds. The Southern Cassowary’s diet also includes many species of fungi that are poisonous to humans. Cassowaries live alone and inhabit the same area all year round. Once the female lays her eggs, the male is left in charge of the incubation and chick-rearing duties, while the female moves away and may even breed again with another male. When the chicks become independent they leave (or are chased out) to find territories of their own. The Southern Cassowary is often heard before it’s seen, with its rumbling calls usually given in response to the sight of potential danger. If an intruder approaches too close, the bird will stretch itself as tall as possible, ruffle its feathers and let at a loud hiss and rumble in an attempt to scare them off. The birds are equipped with huge claws, and will attack a persistent intruder if it feels threatened, although they usually retreat into the dense rainforest. They are able to readily crash through seemingly impenetrable rainforest thickets and quickly disappear from view.